Pitching to the press is SO important to your business’s growth but so many of us put it off because we fear we can’t write well enough. That’s where this book comes in! Written by an editor and independent PR rep, it tells you the easiest ways to grab a busy editor’s attention and make your pitch stand out. This book gives the insider look and honestly lays out what editors love and what they hate. Jena walks you through the research required to pitch to the correct blogs and then helps you create a media list. It answers the basic questions of when to send, who to send to first, and what to do after you hit the ‘send’ button. There are even 7 sample tip-top pitches for you to look at and be inspired by. Tip-Top Pitch Kit contains all the information and inside advice you need to get featured on those big blogs and magazines that you’ve been dreaming about this past year. What makes Jena’s book unique? We’ve seen lots of books about pitching to the media but Jena’s book is unique in that she’s been on both sides. As a shop owner and blog editor, she constantly receives pitches from makers and artists. As an independent rep for other creatives, she’s pitched countless blogs, magazines, and shops for a feature or sale. All of that experience and knowledge makes Jena an amazing source of advice. Her book, Tip-Top Pitch Kit, really looks into what editors want and how you can make your pitch stand out from the crowd. Advice from other editors! Jena worked with 27 other big blog editors to compile advice for pitchees. Their words are sprinkled throughout the book and really offer an even more in-depth look into what editors are looking for when it comes to knocking their socks off and getting a feature. If you want to grow your business and see your service or products featured on some big online blogs or in the pages of a magazine, it’s time to get pitching! 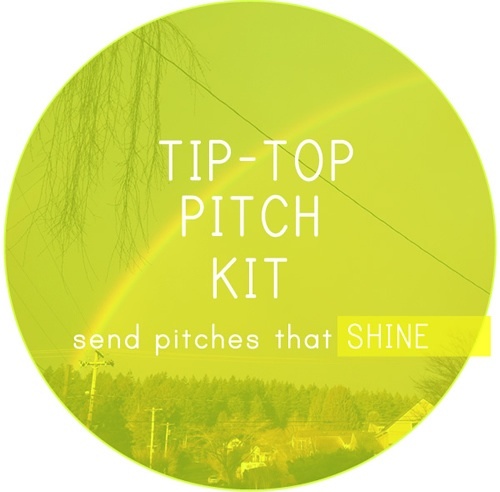 Tip-Top Pitch Kit is a great guide to help you pitch like a pro and grab a busy editor’s attention. You’re definitely going to get some results with this e-book on your side!